It’s rare to hear a scientist at a major research conference take such a clear position. “No one can say any longer ‘we just don’t know.’ We do know.” Those are the words of University of Washington biologist Megan Dethier. Dethier has been leading a study into what has historically been one of the muddier topics in Puget Sound restoration—the environmental impacts of shoreline armoring. For more than a hundred years, Puget Sound’s shoreline residents have been creating seawalls and bulkheads along their beaches, armoring them almost as if they faced an imminent invasion from the sea. These concrete anti-erosion structures abound on close to a third of Puget Sound’s 2500 miles of shoreline. Much of the consensus on shoreline armoring among state and federal agencies has been that armoring is bad for the environment, and the removal of armoring has become a big priority. But this view was based largely on studies in other regions outside the Salish Sea. There were some studies locally, but few peer-reviewed papers to point to. Dethier’s paper changes the landscape significantly. “For years I served on the [state of Washington's] nearshore science team and kept saying 'how can we push for stronger regulations if we don’t have good scientific data about impacts in our own environment? '” Dethier told me. *Armored beaches make sediment coarser and beaches steeper. *Armoring decreases the amount of logs and sea-wrack (such as washed up seaweed) on the beach, two crucial elements for insects and invertebrates that provide food for salmon and other species. *An armored beach can affect unarmored beaches nearby. *Armoring diminishes and threatens habitat for forage fish. I caught up with Dethier and asked her if she could talk a little bit more about her paper. EoPS: What do you think will be the implications of this? It seems like we are in the middle of a paradigm shift for shoreline armoring right now. People are getting real evidence for effects that maybe they just assumed before. M.D. : I think it can only help. Whether it makes a difference is going to depend, entirely, on politicians. But at least no one can say any longer ‘we just don’t know.’ We do know. We may not know every little detail—every stretch of shoreline is different and so trying to find patterns is very difficult—but we know that those impacts are there and we know that we need to do something about it if we want to keep all of the ecosystem functions of our beaches. EoPS: How significant do you think armoring is as a negative factor in Puget Sound nearshore? M.D. : Oh very, very significant in many, many different ways. Forage fish spawning. Chinook migrating along shore having insects to eat [that are drawn to washed-up seaweed]...Most people don’t care about the stinking seaweed, or in fact would probably rather that the stinking seaweed went away. But we know that it harbors all of these other little bugs and those bugs are eaten by birds and so forth. And one of the things I want to talk about in my Salish Sea talk is that while people don’t care about stinking seaweed, there are a lot of things about beaches that people do care about, and armoring affects a lot of them. Whether it’s having sand on the beach for your kids to make sand castles with, or places for forage fish to spawn or places to dig clams. All of those things can be directly or indirectly affected by armoring. 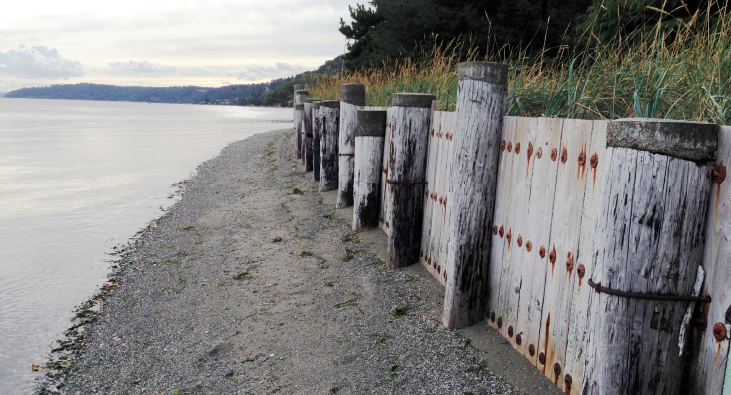 Read more about the impacts of shoreline armoring in our recent series in Salish Sea Currents.